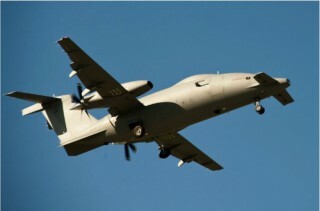 The Italian air force has confirmed that it will be the launch customer for the Piaggio Aerospace P.1HH HammerHead unmanned air vehicle, as it commits to purchasing three systems. This will consist of six air vehicles and three ground control stations, to be delivered in 2016. The order follows on from the first flight of a representative prototype that took place last December. Italy’s air force has publicly supported the development of the HammerHead since the UAV was unveiled at the Paris air show in 2013, but until now was hesitant to commit to a purchase. The medium-altitude, long-endurance UAV is derived from the manned P.180 Avanti twin turboprop. It was developed in collaboration with Selex ES, which will provide the mission control system, sensors, data link and ground control station. “We are truly delighted about this decision,” says Carlo Logli, chief executive of Piaggio Aerospace. “It confirms the strong partnership we have with the Italian air force and showcases the P.1HH as one of the most advanced systems to enter the market. “We are grateful for the continued support of our partner Finmeccanica-Selex ES, the Italian Ministry of Defence, our shareholders and the valuable teamwork with the Italian hi-tech industry,” he adds. The HammerHead system entered a development and certification test campaign following the “seamless” first flight of Prototype 001, which took off from Trapani Birgi air base in Italy and carried out a sortie over the Mediterranean Sea. The prototype flew with the Finmeccanica – Selex ES new vehicle control and management system for the first time and was remotely operated from the Finmeccanica – Selex ES ground control station (GCS), via the company’ datalink and communications systems to ensure safe operations during all flight activities. Finmeccanica – Selex ES also cooperates with Piaggio Aerospace to ensure highly effective integration. The P.1HH HammerHead mission management system is based on the Finmeccanica – Selex ES’ SkyISTAR platform-agnostic innovative solution, which is ideally suited for patrol and ISR missions. The system is capable of responding to diverse threats that range from terrorist attacks to illegal immigration, protection of Exclusive Economic Zones, infrastructures and critical sites. SkyISTAR built-in sensor fusion, data management and exploitation features of skyISTAR enable highly effective border control, wide area surveillance, targeted surveillance, environmental and disaster control missions. Finmeccanica – Selex ES’s contribution to the P1.HH programme benefits from the company’s experience in developing and manufacturing UAS surveillance systems and sensors. In addition to providing the avionics mission system, the company also provides the aircraft’s sensor suite, communications and customised data-link solutions. Finmeccanica – Selex ES is a key partner in the P.1HH programme providing its vehicle management and control system, sensors, data link and the ground control station as well as the integration. SkyISTAR is new agnostic mission system for surveillance and patrolling missions which has been integrated into the programme.